In the first episode of “Do You Even Lift, Bro? Men Exercising Social Justice,” Jake and Carl will let you know how they approach conversations around social justice. You will also get to know more about Jake and Carl, about their journey through masculinity, and their quirks. Hopefully you’ll keep this in mind as we move forward to talk about how men can do some of the lifting in social justice. S01 Episode 02: Is The “Man Box” Changing? Join Jake and Carl as they define and talk about the Man Box. They will discuss the ways in which the Man Box shapes and impacts the expectations of men in the United States. 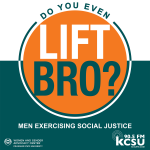 Jake and Carl are joined by Xavier Hadley, a student at Colorado State University, to talk about his experiences with the Man Box and what impacts the Man Box has on him and beyond. They will also ask him about his journey through masculinity and some quick rapid fire questions. Understanding what the man box is and how it impacts us is crucial to men exercising social justice. S01 Episode 03: How does depression show up in men? Jake and Carl talk about how depression can impact men differently. They invite Jeff to join them for the discussion. Jeff a counselor at Colorado State University and brings in expert knowledge that helps Jake and Carl figure out how masculinities and depression come together. You’ll learn from Jeff how depression manifests in men and he’ll tell you strategies on addressing depression both for yourself and other people. The National Suicide Hotline number is 1-800-273-8255. Jake and Carl end the episode with Dillon, a student at Colorado State University, about him and his journey through depression. Listen to learn about the ways understanding depression in men is a way for men to exercise social justice. S01 Episode 06: How do video games impact men? Join Jake and Carl as they explore the ways that their lifetime of playing video games may have impacted their lives as men. They are joined by Thomas, a Colorado State University student and passionate gamer, as he brings in his perspective. They range from talking about their personal experience with video games, their observations of streaming platforms, the different ways that gamers are treated based on their gender, and the culture of gaming as a whole. Knowing where we learn what it means to be men and critically consuming the media we consume is a big part of exercising social justice. Join Jake and Carl as they take a dive into the ways in which men dominate nature. Joined by Alex, a Colorado State University PhD Candidate, they find the connection in the ways this concept of wanting to dominate nature is tied to problematic masculinity. Hear Alex’s journey through masculinity and vulnerability as he tells his stories of hiking and rock climbing. Understanding how problematic masculinities manifest is an import aspect of interrupting oppression and exercising social justice. Join Jake and Carl as they explore masculinity through the prism of slam poetry. Joining them is Christof, a graduate student at Colorado State University. Christof has been writing poetry for almost a decade and recently won a slam competition. He has some great ideas on the ways that poetry factors into men exercising social justice. Join Jake and Carl as they work through the masculine aspects of the way some White men gravitate toward generally eastern Asian cultural beliefs and attitudes. What is it about appropriating “Asian” culture is particularly masculine worthy of being discussed in this podcast? Joining Jake and Carl is Eben, a student at Colorado State University, to pick his brain as a White dude who went through a period of his life of culturally appropriating another racial identity. Understanding the interplay of race and gender is another form or exercising social justice. Join Jake and Carl as they find out that defining “healthy masculinity” comes with it’s very own challenges. They decide that the best way to define healthy masculinity is to start with a more familiar phrase, which is toxic masculinity and work backwards from there. It turns out, there’s a ton of different actions, behaviors, and attitudes we can work on today to work toward a healthier expression of our masculinity. Having this kind of conversation and then following through with our actions is a crucial part of exercising social justice.